And THAT is a proud hubby! 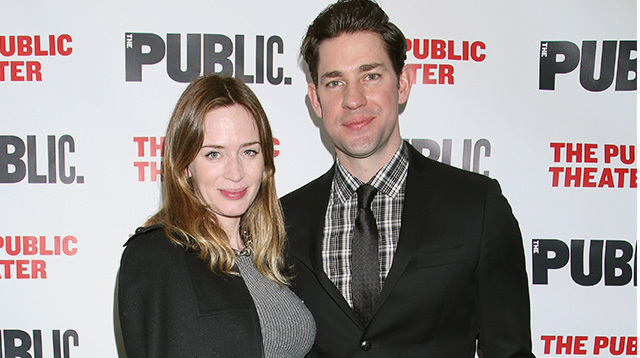 Actor John Krasinski is such a big fan of his wife Emily Blunt’s movie The Devil Wears Prada he has seen it over 100 times. The Office star became obsessed with the 2006 film, in which Emily features alongside Meryl Streep and Anne Hathaway, years before he and Blunt even crossed paths, and he still can't believe he's now married to the British beauty. "I think I saw a good 50 of them before I even met Emily, so... you're getting a confession that I was her stalker and I somehow pulled off a wedding!" he joked on U.S. morning show Today. Krasinski claims he and a male friend ended up watching The Devil Wears Prada in a movie theater when the action film they had hoped to catch was sold out—and he ended up falling in love with the comedy drama, a big screen adaptation of Lauren Weisberger's 2003 novel of the same name. "I remember at the end, I thought it was one of the best movies I'd ever seen," he gushed. The 36-year-old began romancing Emily in 2008, and he reveals she almost caught him indulging in his guilty pleasure early on in their relationship. "I think it was a week or two into dating, she popped by my house to say hi... and I was watching it because it was on TV," he recalled. "She opened the door and I flicked the channel so fast, I think she thought I was watching something inappropriate!" The couple wed in 2010 and John and Emily are now parents to daughters Hazel, two, and Violet, two months.